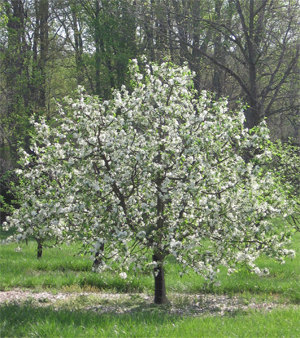 DESCRIPTIONS OF APPLE TREES: This web site gives only a brief glimpse at thirty of the more than 500 old southern apples still in existence. Century Farm Orchards currently has over 400 varieties, most of which are listed in the printed catalog and the Library. There is also a spreadsheet comparison of some of the trees. Pay careful attention to ripening period, taste descriptions, and other information about each apple before purchasing. 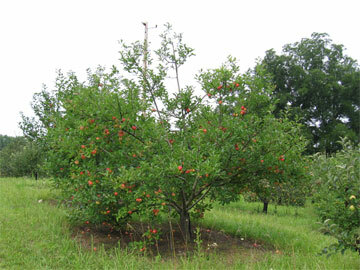 The “ripening period” refers to when the fruit ripens at this orchard’s location in the northwestern piedmont of North Carolina, climate zone 7A. Take note that apple quality is a function of soil quality, tree maintenance, and the taste preferences of the individual.